Doing the right thing doesn’t involve un-necessary guilt. I have a constant and irritating problem, and it involves a computer. Well, to be precise my laptop and our printer. Quite regularly the former will not talk to the latter, in fact frequently my laptop can’t even see the printer. Over the months we’ve had the current equipment configuration, Graham has patiently shown me a whole raft of things that may be the source of the trouble, because it’s never quite the same thing twice. But I’ve a poor memory for tech stuff, and you can bet your bottom dollar that when he’s frantic to meet a marking or report deadline, it will be the moment I simply can’t make them talk to each other whatever I try, with a deadline of my own to meet. I feel guilty interrupting him to get him to fix it, he gets grumpy solving the latest glitch, and I feel more guilty still. Then some time later, problem solved and deadlines met, he gets guilty that he got grumpy. We both feel that we can’t seem to do anything right. It can be the same with the ordering of church life. Those who have been called to and accepted positions of ministry and authority from those around them can, if they are not careful, live with a constant sense of guilt that they are able neither to fulfil the preferences and desires of every person in every pew, nor bring immediately to fruition every sensible and spirit-filled practice that prayer and prophesy lay on their hearts. We get grumpy, and we feel even more guilty. We think there is no good in us, and we can’t seem to do anything right. Likewise, when we first hear and read this mornings scriptures, it would be very easy to be left with the feeling that we can’t do anything right. In Paul’s epistle to the Romans, he’s dwelling on the fact that however much he, or historically the people of Israel, are aware through the Law (the Ten Commandments) that guides how they should live and what the right things to do are, they fail. The Law has in fact been there to show them just how wrong they are, time, and time and time again. From the Old Testament we know that each time Israel has been rescued by God, from starvation, slavery, and exile, it’s not long before they’ve forgotten the faithfulness of God, and they’ve wandered off to place their faith in idols and other gods, only to call on the name of the Lord once again when things turn sour and difficult. We are rightly challenged that we’re pretty good at doing the same thing, and surprised that St. Paul sees himself as being as guilty as any other Jew of his time, or any other man or woman of our time. In fact, there’s almost a sense of relief for us, in the slightly tortured, guilt ridden words of St. Paul; relief that we’re not the only ones who may spend quiet hours wandering in our heads around the inside of our lives, our motives, our lack of faith, our inability to give enough of ourselves to others, or do the right thing. He may have been externalising his own thought processes to talk to fellow Jews living in Rome, but he couldn’t have highlighted his own failings and humanity better; or ours. Our Gospel from Matthew this morning also seems to start by suggesting we can’t do anything right. In a conversation that has come out of John the Baptist enquiring from prison as to whether Jesus really was the Messiah, we find Jesus pointing out that their combined ministries have shown the Jews of their time to once again be a fickle generation. Both have been refused a hearing because they are uncomfortable to listen to, and failed to conform to the stereotypes of the current zeitgeist. Nothing changes. People still have a strong tendency of making a song and dance about their own populist agenda, refusing to consider an alternative focus or reason for their endeavours, and forgetting the love and faithfulness of God. We just can’t do anything right. Or can we? Are we in fact making our things just way too difficult for ourselves, dwelling on our repeated failings, living with a misplaced guilt that suggests that we’re not achieving the right things, and the fact that we have sinned and constantly fall short of the glory of God (Romans 3:23) and all he has called us to be? It is all very well admitting defeat when we can’t fix the computer, being honest about our failure to be always patient or loving towards our family and our neighbours, or knowing we’ve simply run out of our own ability to give because of our own health issues, but if we forget that under the new covenant we don’t encounter God in a list of rules and regulations but in the grace that revealed his love for us through Jesus Christ our Lord, we’re making our burdens heavier than they need be. Living with a constant sense of guilt is not a cross that we are called to bear. Yes, we recognise that following the example of Christ can lead us through a narrow gate to a hard road (Matthew 7:14), and that we must take up the cross of whatever ministry we are called to fulfil in Jesus name, because not to makes us unworthy to call ourselves Christians (Matthew 10:38). But that road and cross should not include a load of un-necessary guilt. Jesus, the gentle, prayerful priest in the second part of our Gospel this morning (Matthew 11:25-30), reminds us that we are called to learn from him, to be his disciples, not just in the things that we focus on doing in his name, but through knowing ourselves loved by God through having Jesus present with us on the journey. The invitation to discipleship is about more than learning or knowledge, computers or even the ordering of church life; it is the adoption of a way of life that is expressed in terms of doing and being something in relation to Jesus. Jesus grounds the invitation in his own relationship with his Father (Matthew 11:27). The proper ordering of our relationship to Father and Son (we know the one through the other) can be deemed “light” and “easy” because an improper relationship to them surely makes for a much harder and more restless life! We ask ourselves what is our relationship with Jesus showing us, and if we forget the ongoing love, grace and forgiveness of the cross and resurrection, we’re missing something vital. We do not rest in the presence of an absent master, but in Immanuel, God with us (Matthew 1:23). Doing the right thing requires us to remember why it is we gather around the table as the body of Christ, each individual, each called, each receiving the body and blood of Christ not simply in bread and wine, but in the sense of knowing ourselves to be chosen, forgiven and loved as God’s own children. That is what makes our burdens light, and lets us rest. Knowing ourselves, and those around us, as loved and forgiven, all made in God’s image and called as individuals but yet part of this corporate body, can dispel the load of un-necessary guilt. Yes, we are then called to practice that which we know ourselves to have received in Jesus, and that is what makes the road a hard one. Of course we will at times fail to meet his ideals and ours, but Jesus’ sacrifice was once and for all, for all people and for all our fallings-short. The right thing to do is to remember that we can always and continually return, lay our failings and our guilt at the foot of his cross, repent, receive and turn with a lighter load, to serve him afresh. Has Facebook banned the use of religious titles? NO, it hasn’t. Here’s why, and how to use yours! 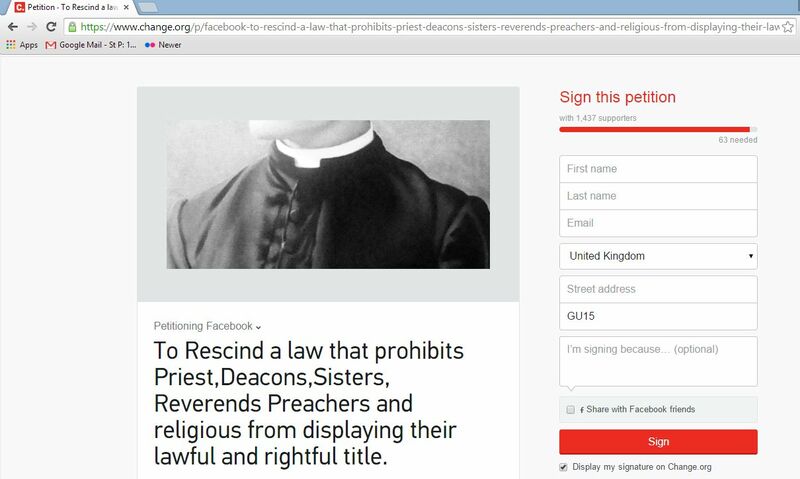 This morning a Change.org petition started doing the rounds among my Facebook friends which seemed to suggest that Facebook had created a “law” that stops religious leaders (implying in particular, Christian ones), from using their appropriate title. The warning was that if you tried to use your “Rev’d” “Father” or similar title, Facebook would stop you accessing your account. This story appeared a couple of days ago, after a Rev’d Fr was locked out of his Facebook account. The Change.org petition appears to relate to it, although a different petition is mentioned in the article. Now, I have a second Facebook account, set up last year when I was ordained, so that my social media relationships with parishioners are separate to those I have with long-standing friends. It’s a boundaries thing, something that lots of us are warned about before we’re ordained. 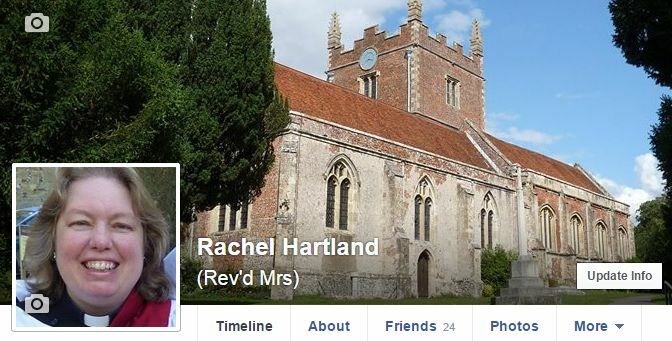 I had, in common with the clergymen in the above article, resorted to using Rev’d in the ‘first name’ box when setting it up, so it read “Rev’d Rachel” and it showed up as “Rev’d Rachel Hartland”. I didn’t really want to have this account blocked, which is why I was interested to find out the truth. Facebook’s policy is in fact that they simply don’t want anyone using ‘honorifics’ as their known name whether born of employment, ordination, good works or anything else. To quote my friend, “It is not a religious prohibition its a general policy.” The rule would apply to a Knight of the Realm as much as a humble curate! But before we still jump up and down saying we really, really want to use our legally acquired title on Facebook, however gained, the answer is – we can. There is a place provided for ‘other names’ in part of our profile set up, and it then shows up on our profile. 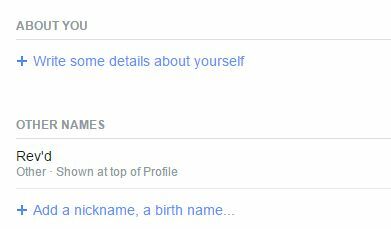 Facebook want to keep people safe by getting them to use their real names, rather than hiding under pseudonyms. It’s for our security, not theirs, and it will help Facebook stop the more dangerous uses of pseudonyms (e.g. for stalking people online) if we respect and encourage their ability to stop people accessing accounts that do not use people’s real names. So, we need to use, and promote, the means by which Facebook have enabled us to honour our calling, and be careful not to assume that social media providers haven’t thought through their policies carefully. There may well be room for improvement, but that goes for ministers as well, and there will be a greater respect on both sides if we try to check things out first, where possible, and abide by the guidance they give. It also means double checking the reasons for petitions it might be suggested we sign up to. This is what we shouldn’t do! What appears on our profile page is your name in bold, and in large, but less bold print underneath, the ministerial title under which you are operating on this Facebook account. All of which seems to me to be quite acceptable. Happy Facebooking ministry friends! This New Year I’ve gone back to an old recipe from our early married years that contains the vital ingredient of my university years – malt whisky. Cranachan is actually a traditional (I assume Scottish) harvest-time pudding, usually made with toasted oatmeal, cream, whisky, honey and soft fruits. What follows is an adaptation of a winter version that I found in the Sainsbury’s Magazine of December 1994. Please note, it’s not for the diet conscious! This can be prepared 24 hours before you need it, but I’ve always done it on the day. For some reason there’s never been left overs when I’ve served it at a party! Prepare the nuts or nuts/fruit mixture which should be in a bowl with sugar, and grate the chocolate – a rather tedious exercise if all you have is an ordinary grater, but worth the hassle (and using chocolate kept in the freezer makes it easier). Allow the mixture to cool! When you’re nearly ready to serve you can put curls of chocolate on top as decoration, and I’ve tended to also put stem ginger on top, to add a little zing. The chalet bungalow we holidayed in, on the edge of a cliff near Mumbles, provided my smart-phone with very poor and sporadic connections. 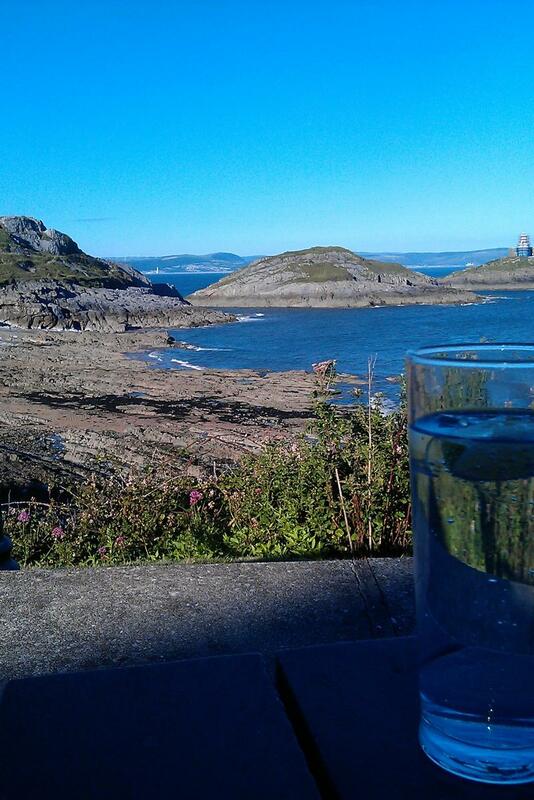 For example to post this photo to my friends and family to say we’d started our holiday, I was ‘forced’ to visit the nearest restaurant (from which the view was taken) and sit on it’s wall look at that view! This may of course suggest that T-mobile need more ‘goomballs’ on The Gower, but it also heralded a period of digital silence in the family. Intermittently my phone (kept on for text communication with wandering teenager) would download chunks of the latest Tweets from my Twitter friends, so I tried to interact as normal. But no, at that point the phone constantly refused to do anything further, having decided it didn’t have enough ‘goomballs’ after all. It initially seemed good to see the encouragement offered by fellow Olympians and others for Team GBs efforts, and their own sense of community was obvious, even if some made ill-advised comments on proceedings (like about the Badminton fiasco.) But it didn’t seem to include tweets from the general public, except by those with a relationship to the competitor, which sometimes seemed too personal and possibly shouldn’t have been published. But, despite on one occasion being alerted to major excitement (Wiggo’s impending awesomeness) by the real-time tweets of Dave Walker and Emma Goldby when the T-mobile ‘goomballs’ were working, I couldn’t even say thank you for the tip-off as I couldn’t engage in two-way conversation. Neither could I download the much vaunted Olympic app from the BBC, or even the headlines from the normal BBCNews app. All utterly frustrating. Yet, I continued to read, and on occasion read out loud to the family, the tweets of friends and their retweets of the famous, enjoying the humour and apposite appraisal of events, as the Twitter feed rolled past. But when I returned home, downloaded the (excellent) Olympic app, I’d sort of got out of the habit of engaging with my Twitter community and didn’t really bother during the second week of the Olympics, though I still watched the feed scroll past. Even the BBC lost interest in Twitter, as I saw almost no Tweets recycled for the public interest, and the presenters seemed more comfortable with Team GB creating it’s own storyline of medals! 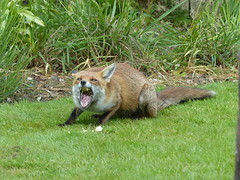 So, what did I reflect on all this digital ‘voyeurism’ as I mis-termed it? 1) I rely on digital news far more than ever before, and don’t really want to wait for set ‘news broadcasts’ on the TV, but instead have got used to having news ‘on demand’. I also rely on people I trust (my Twitter community) to create my ‘news feed’ for me, which means I’m probably almost too selective, since I’ve self-selected my Twitter friends! 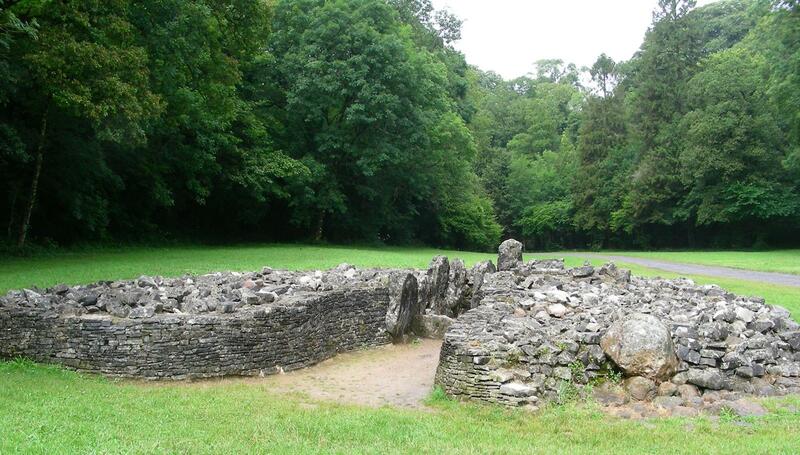 The ancient monument at Parc le Breos near The Gower Heritage Centre – not much signal here, unsurprisingly! 2) Digital media is a bit rubbish in rural, hilly and wooded areas (we tried several other locations whilst wandering The Gower, none were great.) meaning that these communities are presumably being left ‘digitally backward’. If their domestic internet supply is equally tricky, those of us who are social media aware need to remember when we work in and with such communities that more traditional forms of communication are of paramount importance. 3) Twitter is habit forming, but it is possible to slip out of the community and quietly stop engaging without the community really noticing (at least I don’t think that many did, even when I consciously made myself start to re-engage this week). Disengaging to spend more time with the family is probably a good thing, but to then ‘secretly’ watch Twitter, only looking in from the sidelines, seems on reflection to have been rather odd and unhealthy, despite the Olympic sized contributory cause. 4) Why did the BBC dis-engage with Twitter themselves, when I am quite sure they (presenters and producers alike) were watching the Olympic and Team GB Twitter feed scroll post them far more than I was!? So I’m left wondering, what was your digital experience of the Olympics, and how do you cope when forced to take a digital holiday? Do we know why the BBC dropped the idea of repeating Tweets? [‘goomballs’ is a well-used family word taken from the 2000AD ‘graphic novels’ and specifically the ACE Trucking Company, and therefore pre-dating the ‘urban dictionary’ definition of the word! One of the challenges I received through the Christian New Media Conference last month was from Bishop Alan. Bishop Alan suggested it wasn’t necessarily wise or useful to post sermons online. He also said that if we do, we should shrink the general point of the sermon to an abstract of 150 words or less, and remember that sermons are a live encounter with God – what people remember when they hear it preached it is what is important. By blogging it, I can then post the link on Facebook where a large group of my friends are church members. In the past there have been a few occasions where this has provoked further discussion of the an idea. It also opens up the sermon to those who may not have been able attend that particular service but are following say, a sermon series. Similarly in the past I’ve had absent colleagues preaching in a sermon series checking up on me to see where I got a ‘story’ or idea to, either to debate a point or before taking it on the next week themselves! If anyone else finds a sermon I’ve posted useful, either for their own walk with God, or to inspire them in their own preaching, then that is as it were, a grace-full bonus and up to them, and God. That’s how The Text This Week has built up a following (a resource promoted by our Reader Training/DDO tutor). So I think I’ve decided that posting sermons is not a complete waste of time. All I need to learn to do is take that little bit of extra time that is required to write an abstract of it – which is probably not an unhealthy exercise for any preacher who wants to check their message is clear! Oh, and having created original illustration for this post – another of Bishop Alan’s great key points – I better go and photograph the bottle of champagne I used as a sermon illustration for the sermon (see photo) I preached yesterday! 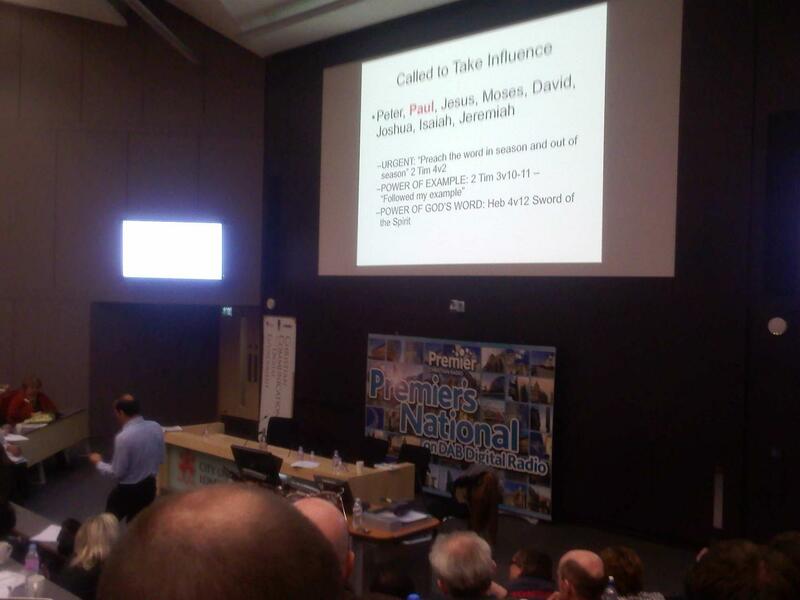 There were many great things about the Christian New Media Conference last weekend. It will take me weeks to sift through the various things that challenged me, or got me asking questions about my use of social media. I could start with the delight of meeting ‘in the flesh’ various social media illuminaries, but others (like the Vernacular Vicar, Revd Claire and the award winning Lay Anglicana) have already made that point. The thing that’s been nagging at me most since Saturday means I’m starting my reflections at the end, with some thoughts on Dr Patrick Dixon’s concluding presentation. Dr Dixon challenged us to ask afresh what our calling is, reminding us that Jesus came to transform the world. How much of what we tweet and blog, he asked, is “ghetto traffic”? How much is relevant to the wider world? If we use the language of our ghetto, he warned, we need to be careful who will see it, as we can be badly mis-understood. Now, I don’t reckon myself a world changer like Dr Dixon. I don’t want to be – at least not on a global scale. If there is to be any butterfly effect from what I do, it will most likely be from simple acts of encouragement, sharing, being there for people, and hopefully by enabling them to be touched in some small way by God. Those things are most likely to happen through face to face conversations of one form or another. But for me to be effective in those face to face conversations, sermons, services and other ministerial happenings, I need to be equipped with all the tools and inspiration that God has placed at my disposal. These include (among other things) the Biblical reflections of others (as recommended to us in Reader Training by our DDO), and their thoughts on and experiences of different areas of ministry. Obviously, there are books, and personal conversations with those more experienced than I to contribute to the sea of wisdom at my disposal, as well as the inspiration of God through the Holy Spirit in quiet moments of reflection; but as the links above suggest, the world of website and blog (accessed increasingly via Twitter, Facebook, and Google Reader for convenience) are of increasing value for being easily searchable. Of course, if I am going to count myself a practitioner in these fields, I too may have thoughts of my own to share, that others at various points in their own faith journey or ministry, may wish to dip into. Making my own sermons and service ideas available is therefore part of a reciprocal relationship (the open-sourcing were were encouraged to elsewhere in the conference) – not so much holding them up as virtuous but holding them out before God’s people for critique. It may, and has, led me to be open to mis-understanding, but it would seem selfish to do otherwise. So, I guess that means I am operating in and expanding the ghetto of Christian bloggers and tweeters, that I took Dr Dixon to be criticising. Yes, I do want to be ‘salt and light’ as the Bible tells us (Matthew 5:13-15) . Yes I do want to show people that God is relevant and can change their world. but for me, at present, that means I need the colegiality of the “ghetto” of blogging Christians to feed the individual face-to-face encounters that fill my ministry in this little corner of the world that Jesus wants my help transforming. Counting #myblessings – what price a phonecall? I try, one day a week, to have a day without turning on my computer. This week, that day was yesterday (Monday 14th) which is why no blog post about Counting my Blessings with Mothers’ Union. So now I’m trying to play catch up. 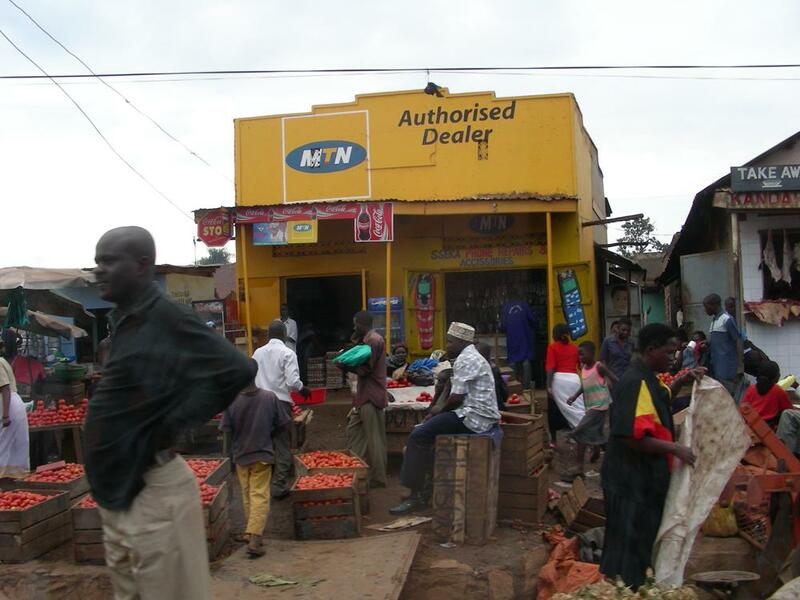 In 2006 when we stayed on the outskirts of Kampala one of the things we were amazed by was the number of mobile phone kiosks along the main roads. It was obvious, and encouraging for the country’s economic development, that since there was no historic telephone ‘landline’ network, the mobile phone was providing a huge change in the communications possible in the country. And yet, because so much of Uganda is very rural and poverty is so high (and the north has until recently, and for so long been subject to civil war), only 14% if Ugandan’s have access to a phone. When it comes to seeking medical help, that must be quite and issue. I don’t think in a busy week of ministry (more funerals), that I really want to count the number of phonecalls that I will make and receive, but I’ll put a significant contribution in the kitty for the MU Family Life Programme. (The MU Count your Blessings scheme suggests 10p for every call you had.) It makes me wonder how I would actually arrange a funeral, working with family members, the undertaker, the lady that does ‘orders of service’, the church office, and possibly the florist, if I didn’t have a phone!? Things wouldn’t happen so fast without the telephone that’s for sure! So who is receiving the blessings here? Is it us who are blessed by the phone? Or is it part of the curse of the western frenetic speed of life, and should we count the Ugandan’s and other less developed countries, blessed by their slower pace of life? 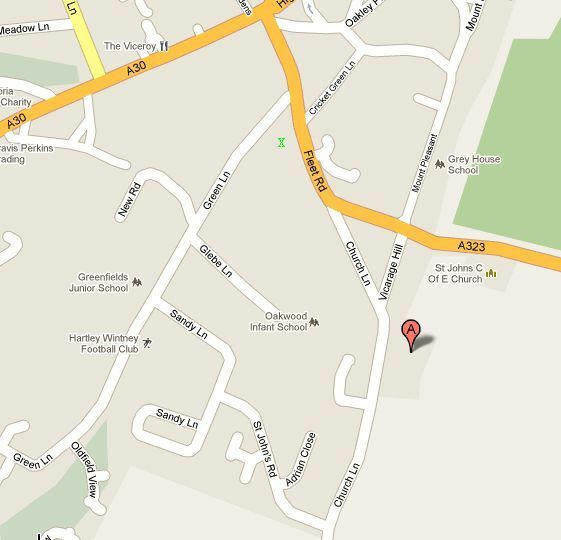 Today my son is playing in a music competition in Hartley Wintney, and whilst checking the location of exactly which school in the village the competition is taking place in, I discovered that Googlemaps have marked the position of St John’s Church Hartley Wintney, in the wrong place! 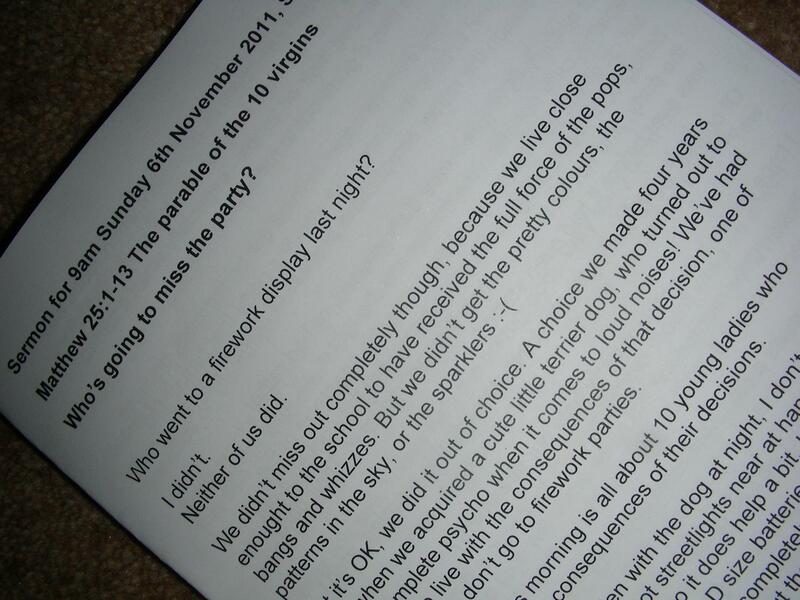 Now it may well be that the church already know this, if they don’t I’ll try and make sure someone there finds out. However, how does anyone tell Googlemaps when they’ve got it wrong? Interestingly, we’re going to Oakwood Infant School which is not that near the red marker that shows where it’s postcode is! Oh the joys of the internet! 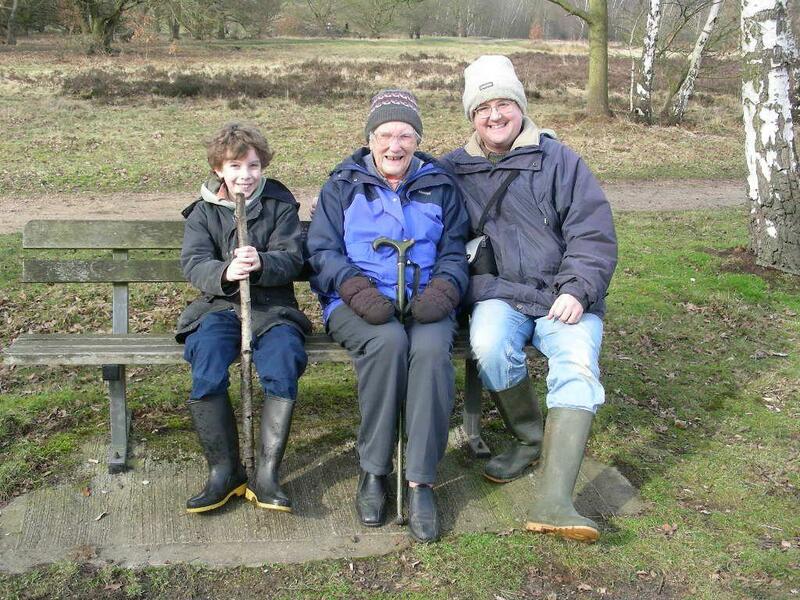 In the period running up to Gran’s death, my husband migrated his ramblings from LiveJournal to WordPress and his thoughts and grieving process, which in many respects occurred before Gran died, appear here. Many of G’s family are not church-goers. However, Gran had been in the past, and from my conversations with her definitely believed in God, and the life, death and resurrection of Jesus. Her husband had been a Reader for many, many years and she had supported him in that ministry. Even before she died, I had been asked by the family if I would therefore be willing to take Gran’s funeral, as it seemed appropriate as the ‘next generation’ of Reader in the family. I was well aware before I ever met Gran, or the rest of the family, that she was regarded as the family treasure. It was something to do with the way Graham spoke of her, and spoke of the way that everyone treated her. I wasn’t wrong,and i’ve never changed my opinion. Gran did “love”, by the (snow) shovel-full. Adam has already shared with us about the sacrifices she made, her stamina and her character as the antithesis of a Mother-in-law. But “love” does not take pride in itself, but in the successes of others – and Gran always took pride in what members of the family achieved: Elizabeth to university and The City, Marion her nursing, then both Graham and Michael as they moved through school, to university and successful teaching careers. She was always there for them both when they came home from school, cup of tea and cake at the ready. Real “love” is often grown through a simplicity of life and outlook, and follows through the tough times as well as people’s successes, and Gran’s story is testament to that picture: She was born Lily Hudson, in East Ham, London where her father was a lighter-man on the River Thames and her mother stayed at home to raise the children, Bert, Charlie, herself and her sister May, who sadly died of TB. When last we spoke at length, appropriately over a bacon and avocado bap with chips at the Windmill on the Common, Gran talked of their simple up-bringing, playing on the roads that were dirt tracks, games like “knock down ginger”, and watching the cricket on the playing fields behind their terraced house until they were chased off by the groundskeeper! She also remembered weekends walking the bank of the Thames to Barking, and was a good swimmer. Lily married Jim in April 1939 (April 22nd) with whom she enjoyed ball-room dancing, amateur dramatics and rambling. During The Blitz, they were bombed out of East Ham, moving to Harrow where the girls were born. Jim was a travelling salesman, and when Marion was 3 they moved to Parkstone on the south coast, and later into Bournemouth. As well as raising Elizabeth and Marion, she nursed first Jim’s mother, then her own till their deaths, and also found time to support Jim in his church commitments as a Reader, and play the piano for activities like family carol singing before Midnight Communion. 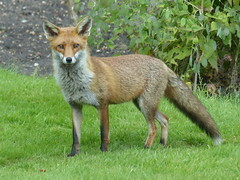 Together they eventually returned to London, and made a home in Viewfield Road, Southfields. Lily worked as a Registrar at Wandsworth Town Hall, and frequently told the story of having “married the butcher” for which service she always received a discount off her shopping. She was always busy, undertaking civil wedding ceremonies for many Jews and Catholics in the community, before they were able to have their own faith ceremonies recognised as legal marriages. In later life they were able to afford and enjoy several cruises, and also visited her brother Charlie in South Africa, but after Jim’s death in September 1979, Marion and Dave moved to the house with their boys. As they grew up Gran was able to enjoy coastal walks and holidays with Marion and although she had many friends, her main focus was always the family. Living in the converted garage as she did, she was a quiet, encouraging companion to those of us that had to learn to live at the rather more hectic conversation speed, and volume, that was shared by the family when all were gathered around her. She was always eager to hear what everyone had been doing. If we dropped a snippet of news into conversation, she’d always say “Go on…?”, eager to have the story or success expanded upon. There were a wonderful selection of doggy companions including Kimmy, Pat, with whom the boys learnt to play ‘tiggy’, then Beau and then the more refined Jamie-dog the Cavalier King Charles. It was Jamie that assisted with the Christopher-therapy after her stroke, as Gran knocked a ball the length of her living room using the up-turned end of her walking stick, so that either dog, or boy, could retrieve it. Gran was patient, Gran was kind. She did not envy, or boast in herself, and only showed pride in those who were the treasures of her life. She lived a life that loved, protected and trusted everyone in the family, and she was certainly not easily angered. It is incredibly difficult, to do justice in a few short minutes to the memories that we all share of someone who brought so much joy and friendship to the lives of her loved ones. Whether they make us smile or cry, we should treasure those memories. We need to make them part of our future as well as our past, in a way that means we can build on the values of love and family life that Gran made the focus of her life. Love, and sacrifice, was of course the focus of Christ’s activity in this world. His was a love that understood grief – he expressed his own loss and pain with tears. The knowledge that Jesus in his humanity, also cried when faced with difficult situations in both his earthly and eternal family, are a comfort and reassurance for those of us who face these situations today. Jesus’ sacrifice of course led him to death on a cross, and to resurrection and his rightful place with God in glory. We can now be assured that Gran too, has her rightful place with God. Gran has been a living example of loving sacrifice. Let us hang on to those values, and continue to live by the example that she set, because it is a good one. By following it, we will honour her name, and the importance of our memories. With today’s news that MU Chief Executive Reg Bailey will head up the government review regarding the issue, by continuing to take the well balanced view that he’s come to be respected for in Mothers’ Union, I’ve started to reflect again on the subject I was already focussing on last week. It would seem that some products and marketing techniques probably do need to be legislated or regulated against. But, it is also important to raise the awareness of parents and others of the pressures they unwittingly place on children’s well being by the purchases they make, whether they are responding to marketing and pester power. This is why I believe the Bye Buy Childhood Report is so good and the Mothers’ Union campaign so important, because it’s trying to create a balanced view of the issues involved. So in case it’s any use to the world at large as interest in this issue snowballs, here is the presentation I gave last week in my local church to get people thinking about the issues. It is a Powerpoint file which can be downloaded from here: Who is buying our childrens childhood. It should read with it’s notes pages so you get the gist of what I said, and what you could say – because you’re more than welcome to use it. I hope I made the questions open enough to simply get people thinking but if you don’t think so, feel free to change them, and let me know the alternatives you suggest. A friend using CNet YouTube Downloader enabled me to use four YouTube video’s of adverts during the presentation. I would hope that this sort of material would be appropriate for a PTA or Church discussion or parenting group – what do you think?